Hi Everyone, Believe it or not, I'm still here. I've been busy, busy longarming for clients the last few weeks and have not worked much on personal projects. As I have done the past few years, I am taking July and August off of longarming, so I am working hard to get my promised client quilts finished in the next couple of months. The summer rest from client work is always lovely. And then I am ready to get back to it in September. The blocks are now 14", but I may trim them down a bit. We'll see. The background fabric is "Coffee Bean" from Pepper Cory's line of Peppered Shot Cottons. I really love working with the fabric and I think it sets off the colors quite nicely. I have been posting to Instagram (@timnatarr) and Facebook (TimnaTarrQuilts) a little more regularly than I have been blogging. If you would like to follow along, please join me over there. I wasn't entirely truthful in my last post. 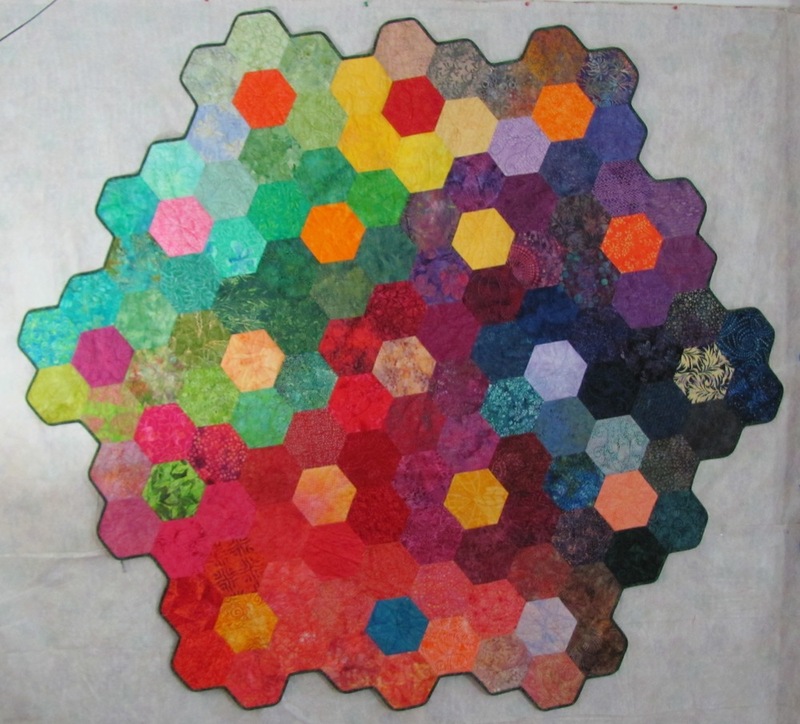 In the last couple of weeks I also made a funky hexagon quilt for my hexagonal loving friend's birthday. Yesterday I was able to give it to her, so now I can share. I honestly thought that her favorite color was yellow, so I tried to add more yellow in the quilt. But I learned last night that her favorite color is blue. Good thing I did not have too many yellow batiks to add in! Each hexagon is about 6" across. ...I say A Big Mess. Because it's that time of year, and because I am avoiding a deadline, it's time to can tomatoes. For the record, I do not recommend leaving your coffee cup in the middle of the tomato mess. Coffee with a splash of tomato juice does not taste good. 24.5 quarts done, and my kitchen is only slightly sticky. I call that a success. Today is my favorite day of the whole year. I never know exactly when it is going to occur, but it usually happens in late May. It's the day my peonies bloom. I anxiously wait for their big flowers and big pop of color in my garden. Of course the other flowers are pretty great. But nothing beats the showiness of the peony.